Switzerland’s Technology and Production Center (tpc) has purchased a DYVI switcher from EVS for its new IP-oriented production facility in Zurich. 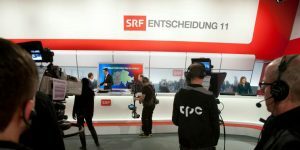 Entirely IP-based using the SMPTE 2110 standard, this facility will be used by tpc to provide production services to Swiss broadcaster Schweizer Radio und Fernsehen (SRF). The production team will also put in place a new XT-VIA live production server and IPDirector content management suite. The software-based live production switcher will be delivered as a single-panel system alongside six PM-Y processing module units – two for each of tpc’s three control rooms. To create a completely integrated workflow, certain operations across the facilities and the DYVI switcher will be automated using Vizrt’s Viz Mosart studio control system. Also being ordered for operation alongside the switcher will be a new XT-VIA live production server with native-IP 10G ethernet SFP connectors and IPDirector suite for the management of the live assets. tpc needed solutions that will operate efficiently within a completely IP-driven workflow, while allowing them to futureproof operations for the output for UHD-4K if needed. DYVI, the XT-VIA server and IPDirector will all be on display through IBC 2018, along with a whole host of other EVS solutions. The show takes place at the RAI Amsterdam between 14-18 September and EVS will be exhibiting in hall 8, stand number B90.